Does an ancient papyrus speak of the Exodus plagues from an Egyptian perspective? Español: ¿Un antiguo papiro habla de las plagas del Éxodo desde una perspectiva egipcia? There is an ancient Egyptian papyrus that some believe tells of the plagues that God sent on Egypt during Israel’s deliverance from that land under Moses. Oddly the ancient document hasn’t caught the attention of many Christians simply because it doesn’t fit their time-table of who the Pharaoh of the Exodus actually was. Most believe the Exodus happened under Thutmose III or Ramses II, but this document puts it much earlier than these pharaohs. But it perfectly fits my theory of when the Exodus took place, and I believe this papyrus — written from an Egyptian’s perspective — describes the chaotic days and the plagues associated with Israel’s deliverance. The document officially named Leiden I 344 is on display at the Dutch National Museum of Antiquities in Leiden, Holland. It was discovered in 1828, but wasn’t translated until 1909, when Professor Alan Gardner discovered it was a lament speaking of a very chaotic time in Egypt’s history. He titled it The Admonitions of an Egyptian Sage from a Hieratic Papyrus. It spoke of disasters, death, mysterious natural phenomena and famine. And oddly it addressed a massive transfer of wealth from the very rich of Egyptian society to the poorest. It was written by a man named Ipuwer who was an actual witness to what happened. He mixes historical with current events and was warning the current rulers of Egypt of divine retribution, such as happened earlier, if they abused their power. The Ipuwer (IP) papyrus is dated to the New Kingdom period of Egypt (16th to 11th century BC). It is actually a copy of a papyrus written years earlier. Most believe it refers to the period when the Hyksos conquered and controlled the Northern half of Egypt as the document speaks of the invasion of Asiatics (about 18th century BC). Like Israel, the Hyksos were Semites. I believe it was during the Hyksos reign that Joseph was sold into slavery in Egypt. Since they were cousins — similar language and culture — it explains why Joseph was able to rise to second in command in Egypt. There are some interesting references in Genesis that clearly show the Hyksos were in charge when Joseph was there. For a more complete discussion read my article: The mystery of the Egyptian guard. I suspect the Egyptians considered the Hyksos and Israelites a basically the same group of people. 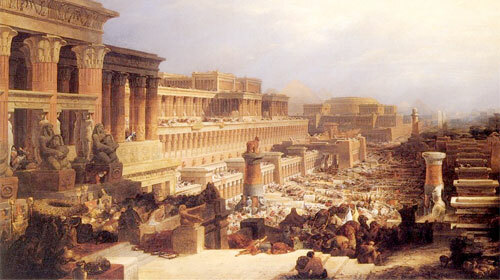 When the Egyptians were finally able to drive the Hyksos out, the Israelis remained. The Bible says there was a new King in Egypt who did not know Joseph. With the Egyptians now back in control, the Pharaoh turned against the Israelis fearing they would join with the Hyksos, if they tried to retake Egypt (Exodus 1:8-10). The Egyptian pharaoh who retook Egypt was Amhose I (around 1500 BC). However, because of the several years that passed (Moses growing up in Egypt, leaving and then returning), the Israelis exodus did not take place under Amhose, but his son Amenhotep I. The archaeological record shows that though Amenhotep I died childless, he had a son who died as an infant (Exodus 12:30-32). There are a number of elements in the Ipuwer papyrus that refers to plague of Exodus. I used a translation provided by Rabbi Mordechai Becher of OHR Somayach a Jewish Bible school. Bible: Exodus 9:3 records that God struck the cattle and all the animals of Egypt with a sickness. Bible: God judged Egypt with an infectious boil that broke out into open wounds. It not only struck people, but animals as well (Exodus 9:8-9). Ipuwer papyrus: “Plague is throughout the land. Blood is everywhere” (IP 2:5-6). Ipuwer papyrus: It speaks of crop failure that affected the Egyptian revenues. “Lower Egypt weeps … The entire palace is without its revenues. To it belong wheat and barley, geese and fish” (IP 10:3-6). It also reads, “Forsooth, grain has perished on every side” (IP 6:3). It also compares the weariness of the land to the “cutting of flax,” that would happen with a massive hail storm (IP 5:12). The Bible: Associated with this massive storm was lightning that rolled along the ground. Fire was mixed with the hail (Exodus 9:23-24). Ipuwer papyrus: Speaks of damage due to fire. “Forsooth, gates, columns and walls are consumed by fire” (IP 2:10). Bible: Exodus 10:22 says that a great darkness covered the land for three days. Bible: The last plague involved the killing of the first-born of every family, including the Pharaoh’s (Exodus 12:29-30). The Bible says a great cry was heard throughout Egypt (Exodus 12:30). Ipuwer papyrus: “Forsooth, the children of the princes are dashed against the walls.” (IP 4:3, 5:6) “Forsooth, the children of princes are cast in the streets” (IP 6:12). “He who places his brother in the ground is everywhere” (IP 2:13) and “It is groaning through the land, mingled with lamentations” (IP 3:14). Despite the obvious connection to the plagues of Egypt, the papyrus refers to two other incidents that in my estimation seal the deal. This type of event was so unique and unexplainable. What cataclysmic events would cause the rich to forsake their wealth and give it to slaves? But there is yet another reference in the papyrus that addresses a second event unique to this time. As Israel left Egypt, the Bible says that God led them with a pillar of smoke by day and a pillar of fire by night (Exodus 13:21). The Ipuwer papyrus talks of this incident but from a slightly different perspective. Though they spun it as an attack on their enemies, it is very clear that a towering fire was associated with Israel’s departure. Does an ancient papyrus speak of the Exodus from an Egyptian perspective? Yet another confirmation of the Jews exodus out of Egypt? Another confirmation of Exodus: Has a statue of Joseph been found? Was a Pharaoh’s violent death curiously connected to to Joseph? Can you elaborate a little here? It doesn’t bother me that we have not yet found archaeological evidence of the exodus, but it certainly is a drum beaten loudly and regularly by the scoffers. Yeah, it is a bit unusual. The problem is if it happened at the end of the Hyksos reign, this puts the Exodus much earlier (300 to 400 years earlier) than previously thought. Many think the Pharaoh was Thutmose III or Ramses II (http://www.bible.ca/archeology/bible-archeology-exodus-date-1440bc.htm). However, from my study of Joseph’s time in Egypt from Genesis, I concluded his rise to power took place during the Hyksos rule. I believe the book of Genesis itself provides evidence the Hyksos were in power at the time of Joseph (see https://opentheword.org/2013/07/15/the-mystery-of-the-eqyptian-guard/). Israel’s vacation in Egypt came to an end, when the Egyptians drove the Hyskso out (a new King in Egypt Ex 1:8). So when I stumbled across this papyrus that spoke of these events taking place during the Hyksos rule, it confirmed what I had thought previous. I agree, finding evidence, or not, doesn’t affect my faith, but I personally find it interesting. Thanks for your comment. I have heard of that DVD, but never seen it. There are certainly a few theories floating out there on who the Exodus Pharaoh was.